Some of my favorite things about living in NYC are the relics of days past. You feel history all around you. Walking through each neighborhood, you can pretend to be living in a different era, listening to shouting street vendors, trolleys, and carriages. There are historical secrets to unlock on just about every corner, you just need to take notice. One of my favorite tea and coffee shops in the West Village quietly holds some of these secrets. 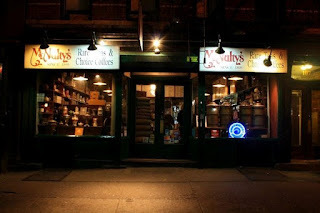 Much of the West Village feels like you've stepped into the late 1800s, but that feeling is increased tenfold when you walk through the doors of McNulty's. The sign will tell you they've been in business since 1895, and it shows. With your first creaky step inside you are met with the scents of old wood, quality coffee, herbs, and of course tea. History is in the air. The cozy store is lined with wooden shelves that are slightly slanted from years of use. A dizzying array of jars filled with tea are placed on every available surface. Imported and domestic packaged teas also line the walls, along with coffee and lots of accessories. Even though the store is tiny, it is packed to the gills with products. It took me awhile to walk around and get my bearings. I was impressed that the two gentlemen behind the counter waited patiently to see if I needed any help. I wasn't immediately bombarded to see if I needed anything. I liked this. I was still in search of a good black Yunnan tea, so after looking around for awhile I asked the gentleman behind the counter for a recommendation. He happily started talking about the black Yunnan teas, and how they smelled and tasted. This man clearly knew his stuff. I ended up with two different teas that I couldn't resist (post coming soon). An older gentleman measured out my teas in a beautiful old fashioned scale that looked as if it had been sitting there since the store opened its doors. I was able to get 1/8 a pound of one of the teas, which was nice. Not all tea shops allow such a small amount to be purchased. My one gripe is that the teas were stored in glass jars. Teas are very sensitive to light, and this impacts the freshness. But there wasn't a large amount stored in the jars, so I'm hopeful a high turnover keeps the teas nice and fresh. I'd also suggest transferring your purchased teas to an airtight canister and not keep them in the paper bag for too long. This last visit was about an hour before they closed, so the store was quiet and peaceful. It does get quite crowded during the day though. So if you go, be prepared for some close quarters. It is worth it, to experience a place that radiates over a hundred years of history. There are not many places where you can browse a huge selection of tea in such a charming atmosphere. 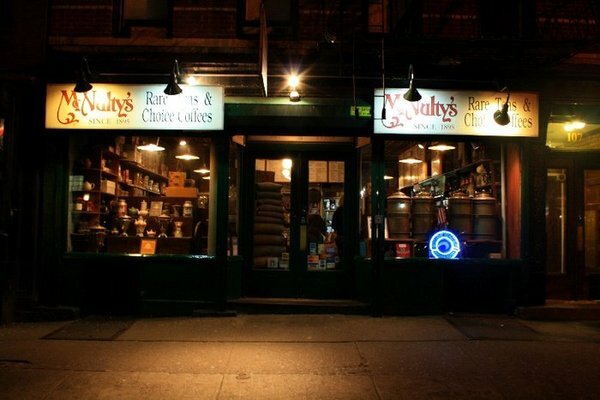 For those of you that have visited McNulty's, do you have any favorite teas? Thanks so much! I appreciate the comment. I hope you can get there sometime.